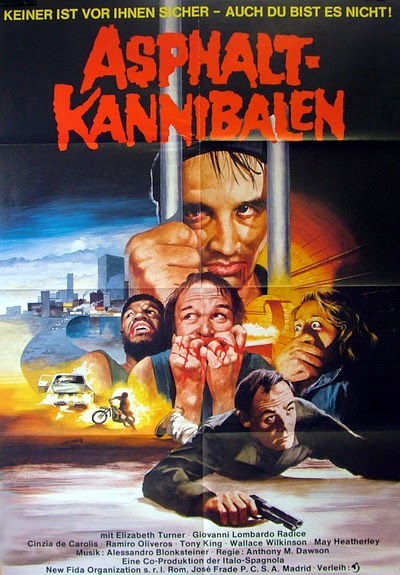 Cannibal Apocalypse Directed By Antonio Margheriti. Starring John Saxon (1980). The film opens in Vietnam with Norman Hopper played by John Saxon, he is leading his command toward a suicide mission. A German Sheppard strapped with a bomb brings forth a wave of shrapnel and fire as a few casualties go forth and explode. The soundtrack exudes a 70’s style wacka guitar sound combined with electric piano and organ as a woman runs screaming toward an open pit. The soundtrack done by Alessandro Blonksteiner is nice and melancholy with a little 70's corniness thrown in. These films are usually a direct contrast to what happens on screen. The Action is counterbalanced with softness or the disgusting illustrates with beauty (as in Cannibal Holocaust). The two infected soldiers await to consume her barbecued flesh as they pull open her skin and feast upon it, in the process they almost take Hopper’s arm off. John Morghen and Tony King play the cannibalistic veterans. Tony King had a few years ago acted in one of my favorite blaxploitation films Gordon’s War. This is where it all started for Morghen, he has such a naturally demented quality with his jagged teeth and detached stare he is a staple of this genre. Dardano Sarchetti. is one of the reigning champions of Italian gore cinema, slaved over a hot typewriter for this one and many others. He is the man that coincidentally named Morghen’s character Charles Bukowski. He is also one of the main reasons Lucio Fulci was so brilliant and after their break up Fulci's films suffered from poor dialogue (as opposed to unintentionally funny dialogue)! The opening flashback is now a harsh reality for Saxon to face as he receives a phone call from his army buddy, recently ejected from a VA hospital and dumped out in the streets to fend for himself in a cold and uncaring society. The message Cannibal Apocalypse conveys (whether its intentional or not) is that mental health is still a primitive field stuck in a dark age that may never evolve. The U.S. chooses to ignore its wounded and mentally unstable, it would rather live in denial about it’s veterans then try to fix the problem. It's only solution is to designate them to homeless shelters or avoid the problem all together. The same cycle of forgotten soldiers is still happening today and thankfully, post traumatic stress disorder is being taken more seriously. There has yet to be an Iraq war vet cannibal film though. Once a soldier is checked out, given meds and let go to filter into a ruthless society they either adapt or live on the streets armed with a gun and become dependant on drugs. Hopper (Saxon) does what he can to calm down Bukowski after he barricades himself into a thrift mall and chases around a few clownish bikers. A choice line from Morghen is " You Piss on it", in regards to putting out a police tear gas bomb. He is ill equipped himself, to deal with Bukowski's problems and becomes disenchanted with his own suburban existence, opting to start an impure relationship with a neighborhood girl half his age.Check out this NSFW pic of Cinzia De Carolis who plays the girl next door. Bukowski is unhinged and has bitten a few bystanders at a movie and definitely infected them. Sarchetti has taken the metaphor of cannibalism as a Western disease away from the jungles of Vietnam and manifested it into a problem that America can only ignore for so long. The characters make their way toward the mental hospital and manage to infect a doctor and a nurse, who oddly enough, after being bitten join their crew and high tail it down toward the sewer. The police presence in Apocalypse is viciously offensive and often hilarious. The gore content has a mean edge and unlike most other Cannibal films only a few rats are torched, no animals anyone cares about were harmed (PETA wasn't on the set). It’s alittle inept at times, but highly entertaining and worth watching with a psychological concept missing from many brainless cannibal flicks (or maybe I’m giving it waay too much credit). It has since been taken off Youtube but you can rent the DVD from Netflix here.